I’ve been working on renovating my house. And any time you renovate anything, you have to think through what you want to keep and what you would like to do differently. As many of you know, I work out of my house and I have a beautiful studio filled with orchids, looking out over a Japanese fountain currently surrounded by apple blossom double begonias. Even though I have this totally uplifting, sublime place to practice my work, I wanted a room of my own in my house where I could have my own yoga practice without any distractions from the thought of work. I planned out the perfect spot. It’s a small room across the hall from my bedroom. First I had my wonderful painter, Dan Stone, patch the holes in the ceiling and floor and cover the walls with paper moon, a delicate yellow. I put up a ceiling fan with a muted, diffused ceiling light. 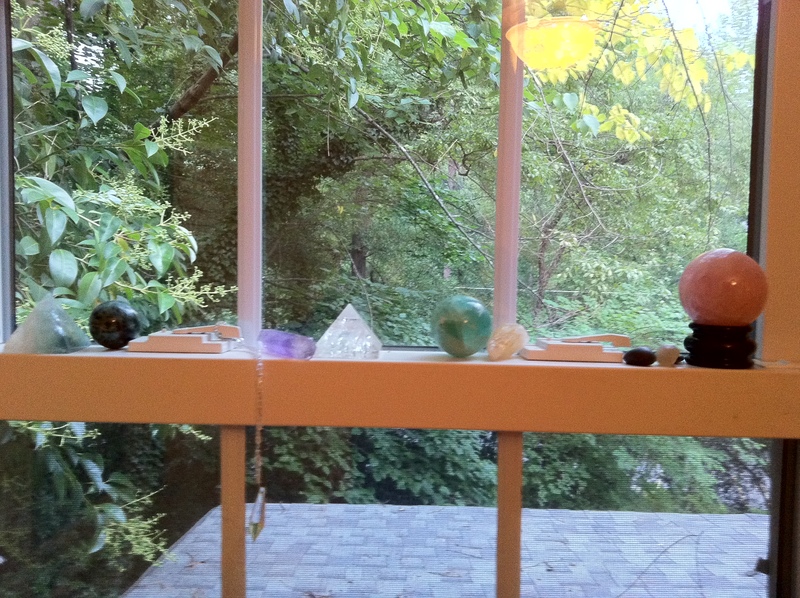 I set crystals in the two windows to refract sunlight that comes through at different times of day. Against one wall, I lay out my far infrared sauna, which is also important to me. And I have a basket of angel cards, inspirational books and notes for healing work so that I can do my own inner work on myself when I am lying in my sauna. I lay out two fresh, cushy green yoga mats, one on top of the other, to give me plenty of padding on the hard wooden floor. They lay waiting for me. The room stood virtually unused for many months, except for when I would go in to lie in my sauna. I just could not convince myself to go in there to do my yoga until this weekend, when a friend of mine called me from his cell. He was in Costco and wanted to tell me about an iphone music player he saw there. I was so excited. The final, missing ingredient. My friend got me the iHome Studio Series featuring Bongiovi Acoustics DPS, whatever that is, for $160. My friend, who is an audiophile, told me that the sound is as good as his old stereo system that he paid $10,000 for some 10 years ago. I am not an audiophile, but I had already paid $36 to sign up for Pandora One so that I can listen to my music uninterrupted by advertisements. We installed the iphone player in my bedroom across the hall from my yoga room, and the music is strong and clear enough so that I finally have the music I need to run through my veins while I practice my yoga. After coming home from my friend Jose Blanco’s yoga book club this evening, I put my iphone in my new music player. I turned on the Aretha Franklin and Mary J. Blige station on Pandora. Perfect! I was off and running. I did vinyasa after vinyasa, flowing from one pose to another. I stood on my head, did modified handstands, shoulder stand to half shoulder stand to bridge to wheel to fish to flying fish. I was worried about leaving hand or foot marks on my pretty yellow wall, but decided it was worth it. This is my room, after all. Years ago, I read Virginia Woolf’s A Room Of One’s Own. It’s all about how, if you want to be a writer, you have to have a room of your own to write in and enough money to support yourself while you create. I now have a room of my own for yoga. Wow!